Kloten is a city in the Bülach district of Switzerland and belongs to the Canton of Zurich in Switzerland. It is located about ten km from the city centre of Zurich and lies on the plain of the Glatt Valley. Kloten offers various sights which you can visit during your stay in Switzerland, for example the Reformed Church of Kloten or the Roman Catholic Church of Christ the King. There is also the Mittelholzer-Monument, which was erected for Walter Mittelholzer, an aviation pioneer. Zurich is the capital of the canton of the same name and also has various sights which are located almost exclusively around the old town. They can therefore be easily reached on foot or with a short bus or tram ride. Take a look not only at the monuments and buildings, but also at the location of the city on Lake Zurich. At Bürkliplatz or Belvue you have a phenomenal view of the Alps and the lake when the weather is fine. Both banks with parks and promenades are heavily frequented by the city's residents and tourists. With a rental car from you can explore the surrounding area comfortably and cheaply. Rent a car for less and discover the surroundings. Zurich Airport has the IATA code ZRH and is located in Switzerland. It extends across various suburbs of Zurich. The northeastern part of Zurich is the military airfield from which civilian flights began in the 1930s. In 1945, it was decided to build a new international airport. Construction began in 1946 near the town of Kloten. These were almost completed by 1948. The first provisional flights started in November 1948 and the ZRH Airport was officially opened in August 1949. In this context, a large air show took place. Flights operated by the airlines Swiss Air, Belair, Edelweiss Air and Helvetic Airways take off and land at ZRH Airport. Every year, more than 22 million passengers are served at the only terminal to date. There are flights to destinations all over Europe, Japan and South America. Information desks are located in the arrivals halls and departure hall 2, as well as various fast-point counters at the airport where you can obtain information about the airport itself. But you can also learn important facts about flight schedules, shopping, maps and public transport. At the Service Center, you can obtain information on rates and parking spaces or store keys and documents. Hotel bookings are also possible. You can also book your flight to Switzerland online. Cheap car hire and comfortable travel to Zurich. You can eat and drink throughout the airport. There are bars, cafés and restaurants all over the place. There are classical national dishes, but also international dishes. If you just want to have a quick drink, you can do so in one of the cafés or bars and sit down comfortably. If you want to withdraw money at the airport, you can do so at ATMs or bank counters. Branches are located in all arrivals and departures halls. The vending machines are also distributed throughout the airport. If you want to change money, you can do so at a different exchange counter, which is also located in the arrivals and departures halls. Telephones, photocopiers and fax machines are available at all fast-point counters and can be used publicly. Hotspots are located in all main waiting areas of the airport. There you can connect to your notebook or other mobile devices and surf the Internet. For a fee, this is also possible at the computer stations in the public area. Of course there are also several shops in the airport ZRH. There are restaurants and more than 60 shops in the Airside Center. There you can spend your waiting time shopping in various shops. There is not only a department store, but also a bakery, delicatessen and confectionery. Fresh products and specialities are available in the grocery stores. There are also various duty-free shops in the passenger area. A large selection of spirits, tobacco and perfume is available there. Already one hour before the first flights open the shops and close when the last one is called. Afterwards, pick up your rental car at the pick-up station of the car rental company and travel cheaply. Various guided tours are offered at Zurich Airport. You can take a look behind the scenes of the company, as the tour goes through every important area and takes about two hours. Furthermore, you can also take part in a bus ride on the apron, where a speaker will inform you about everything. The journey takes about one hour. If you would like to take part in a guided tour or trip, you should register at least four weeks before the desired date. Book your flight to Switzerland online and save time. Rent a car at a discounted rate on the Internet at the car rental company of your choice. Where can I pick up my luggage at Zurich Airport? After the flight you will be informed by the flight staff where to pick up your luggage. Depending on the flight, the individual baggage belt can be located in different places. Luggage storage is open daily from 6am to 11pm. You can drop off your luggage and items that are kept there for up to three months. Shopping bags can be stored for a maximum of 12 hours. In addition, luggage racks are also available for you. They will carry your luggage for a fee to the car, the outstation or the check-in desk. Would you like to book your flight to Switzerland online? This is possible at any time. Cheap car hire at the airport. Where are the Rental Car counters at Zurich Airport? You have booked a cheap rental car online and would like to pick it up at Zurich Airport? The car rental counters are located on the first floor of Airport Shopping. There you can take care of all the formalities before you can go to the pick-up point and pick up your car. Rent a car online cheaply and travel comfortably and flexibly through Zurich and its environs in Switzerland. At the airport there are counters of the companies Alamo, Avis, Budget, Europcar, Hertz, National and Sixt. Car rental online and cheap car hire. Where is the pick-up station at the airport (ZRH)? The pick-up point of the chosen car rental company is also located on the first floor of the shopping area. Pick up your rental car at the pick-up station and drive relaxed to any place in the Zurich area. You can return your rental car by following the signs for "Departure, Rental Car Return" and following the signs for "Departure, Rental Car Return". Pick up your rental car at the pick-up point of the car rental company and drive to your accommodation. Where is there a gas station near the airport? After you have picked up your car at the pick-up station of the car rental company, you want to refuel your car. The nearest petrol station is located directly on the airport grounds. Rent a car of your choice cheaply online and travel comfortably through Switzerland. What is the traffic connection at Zurich Airport? Zurich Airport is located in the heart of Switzerland's transport network. You can therefore easily reach the airport itself and all surrounding towns and villages by car, which you can rent at a car rental company of your choice. The A1, A20 and A51 motorways link the airport directly to the cities of Basel, Bern, Büllach, Glattbrugg, Kloten, Rümlang, Schaffhausen, St. Gallen and Zurich. This means that you can easily reach all major cities by car, which you have previously picked up at the pick-up point of your car rental company at the airport. What do you need to know about traffic in Zurich? If you are travelling in Switzerland with your rental car, which you picked up at the airport ZRH, you should not drink alcohol. What is the promiscuous limit in Switzerland? Please note that if you drive a car under the influence of alcohol, you will be subject to heavy fines. Depending on the offence, even prison sentences may be imposed. If you are travelling in Switzerland with your rental car, which you can rent cheaply from the car rental company of your choice, you should also note that rail vehicles in towns and villages have the right of way on equal roads. On mountain roads, the car that drives uphill always has priority. Vehicles driving downhill have to drive back when they can no longer evade and the other vehicle is not closer to a passing point. When meeting different vehicles, such as trucks and cars, lighter vehicles have to recoil. On mountain-postal routes these buses and post buses always have right of way. If you come across such a vehicle with your rental car, you must strictly observe the instructions and signs of the drivers of these vehicles. You can recognize mountain-post roads by the signpost with a post horn symbol. You have picked up your rental car at the pick-up point of the desired car rental at Zurich Airport? Then you might want to go to your accommodation or visit the various sights. In and around Zurich there are several buildings and other sights worth seeing. Rent a car for less and save time and money. 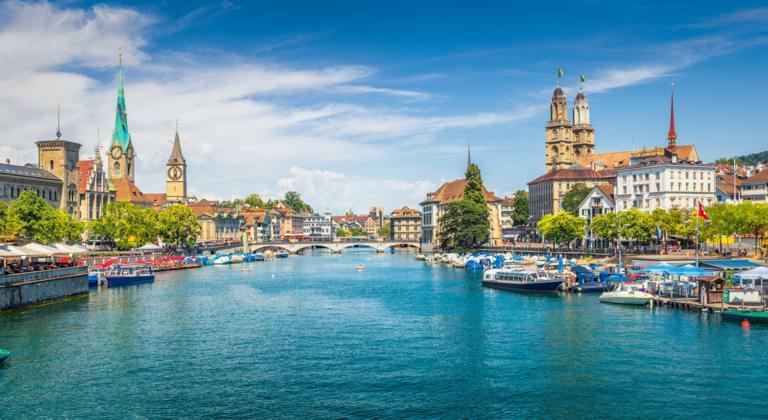 Rent a car at Zurich Airport and drive to the well-preserved old town, which is located on the left and right side of the Limmat. Ideally, start your tour at Central-Platz, which is located opposite the train station. From there it goes to Belvue Square, where you cross the Limmat river. Continue to Münsterplatz, then to Lindenhof, to St. Peter's Church and again to the town hall. Here you cross the Limmat again and go back to the station. On the right side of the old town is the town hall, which was built in Renaissance style, a Romanesque cathedral and the starting point of the Reformation. With the rental car it is of course also possible to visit other sights outside the city. Rent a car of your choice for less and pick it up at the airport.